Our trip to Italy was so much fun and we saw and did a ton! In case you missed it we went to Venice, Rome and a road trip through Tuscany. 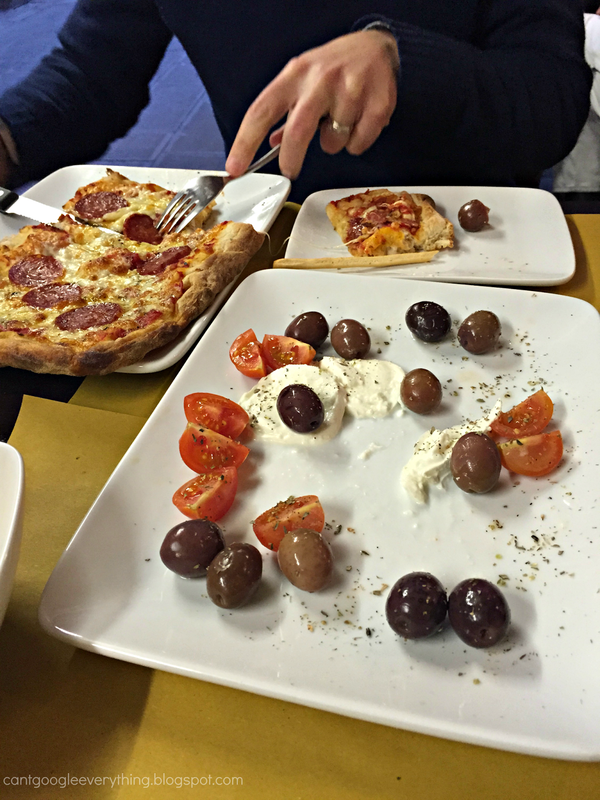 What I didn’t mention in my previous Italy posts was all about the food! 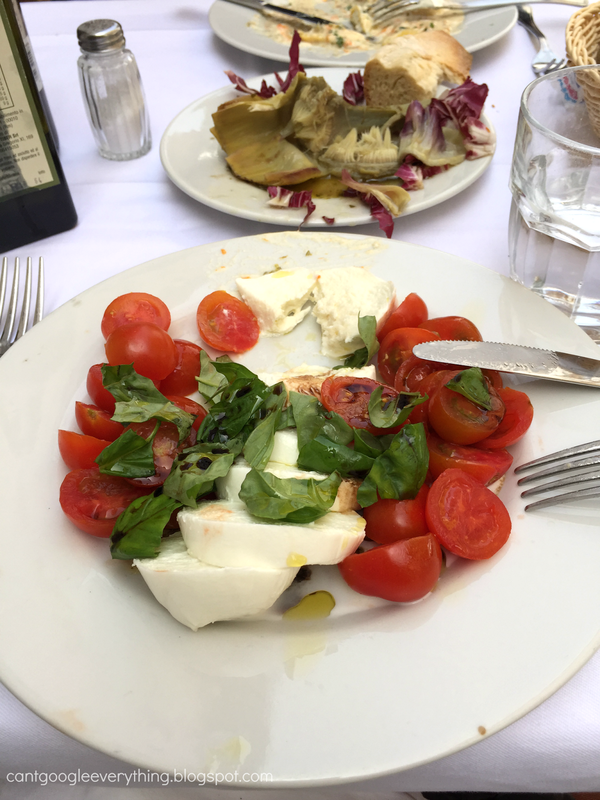 Meals in Italy are slow and a whole big event. Even though the food became very repetitive over the course of our trip, it was all still very good! Our first night in Venice we shared an appetizer of cheese, tomatoes and olives. My husband also had pizza! 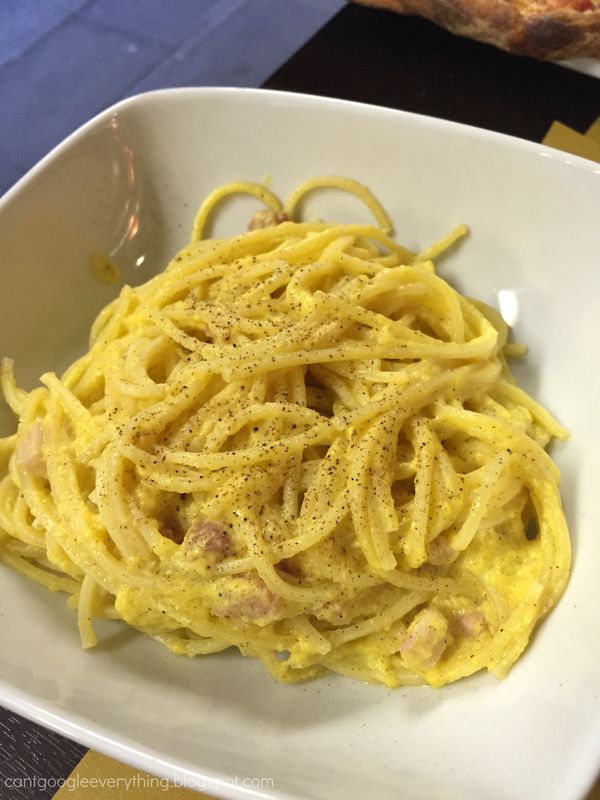 I had pasta carbonara! It was quite salty, but really good. This was the most “Italian” meal I’ve ever had! As it turns out, most of the restaurants had very similar menus everywhere we went- various pastas, pizzas and similar appetizers. All the restaurants had house wine that was super cheap, but also amazingly good! We never felt the need to buy an expensive bottle or glass of wine, because the house wine everywhere was just awesome! In Burano we had lunch on the island before heading back to Venice on the water bus. I had a calzone the size of my head! Can you guess how much of this I ate alone? The drink you see is orange Fanta, but you’ll notice it’s not the neon orange that Fanta is in the United States. No hot orange food dye here! Fanta in other countries is always so much better, in my opinion! One night in Venice we splurged on a fancy dinner on the water. I had crêpes for dessert, not exactly Italian, but amazing nonetheless! 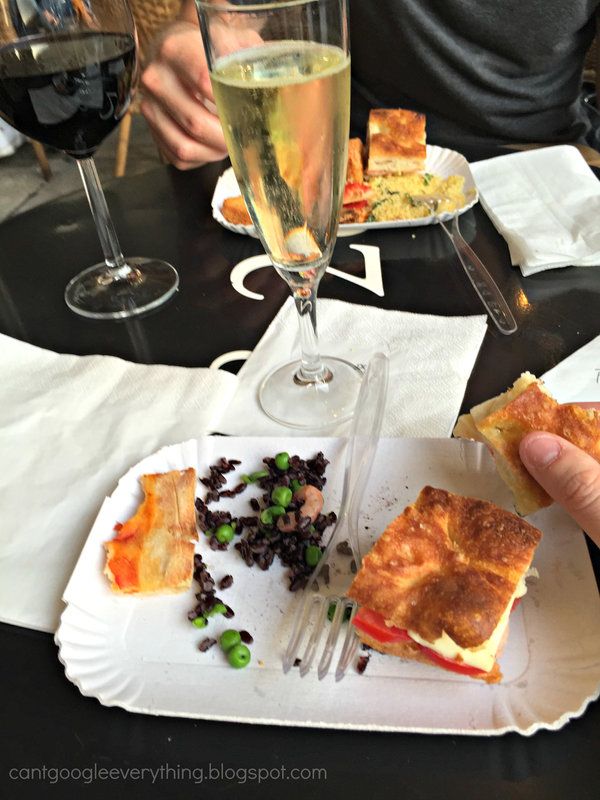 Everywhere we went we saw locals enjoying an aperitif, or before dinner drink, so we decided to try it out one night for ourselves! We tried the “spritz” aperitif, which was a little bitter and a little sweet. Not bad overall, but I still prefer a glass of wine with my appetizers! Our first day in Rome we were hoping for a little something different so we asked our hotel owners for recommendations. They directed us to try a nearby restaurant called Macaroni, so we headed there for lunch. I had a caprese salad and my husband had ravioli. The salad was fine, but the ravioli was ah-mazing! We seriously discussed going back to this restaurant just so we could get it again for dinner! We also split an artichoke served Roman style, steamed in vinegar and drizzled with oil. One of our nights in Rome we decided to try the new trend of “buffet” which was like a happy hour with some snacks included. For 10 Euro I had a glass of Prosecco and access to the buffet of snacks! We tried little sandwiches, salads and small cut up pizzas. This is not supposed to replace your dinner, but it was very filling and we certainly didn’t need a big dinner after! Our hotel room in Rome was fully equipped, which I know I mentioned in my Rome post, but seriously it had an espresso machine! We made espresso and cappuccinos right in our hotel room, because there was also a milk frothing machine! Even the coffee in our hotel room was amazing and perfect, something I’ve never said about a hotel room ever! Another night in Rome we headed to an amazing restaurant that was a little off the beaten path. 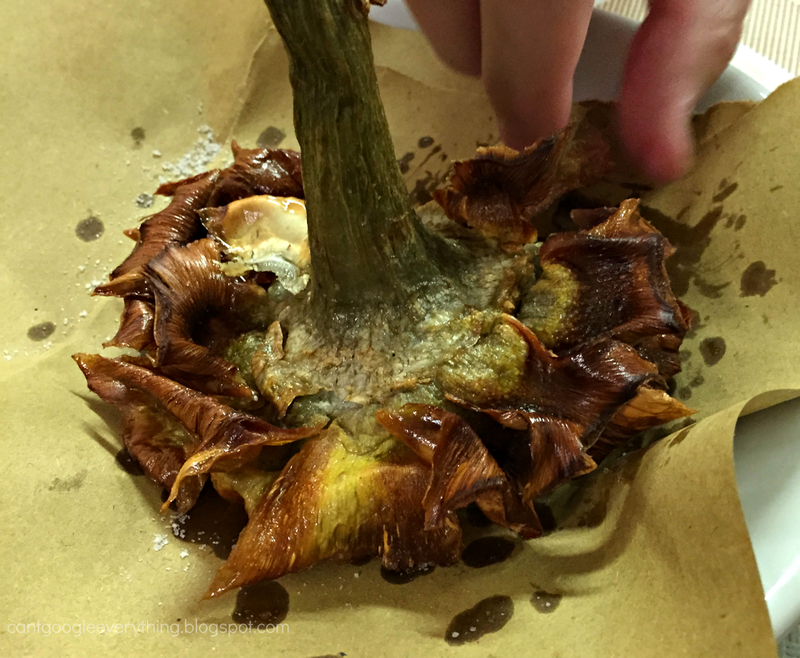 We tried another artichoke, this time served “Jewish style” which was fried and tasted like artichoke chips! We both liked this one much better than the first one we had. 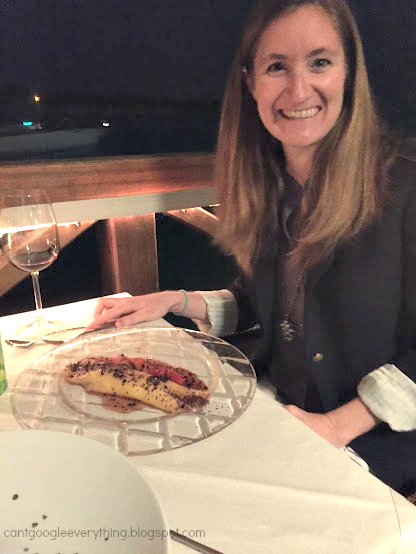 At that same place I also had a stuffed zucchini flower, which was awesome! We also had pasta and dessert, both very good, but the apps were the most unique! I would be remiss if I didn’t mention this little treat! It’s a little frozen coffee drink with plenty of whipped cream on top. I can’t remember what it was called, but it was yummy! Last but not least was our last night of the trip, which we spent in Florence. The food here was a little different- more baked food and more meat varieties on the menu! This was the first time I saw lasagna on the menu, so I had to try it of course! My husband had a pasta dish, too, and osso buco. The osso buco was really good, but I was so full from the lasagna I didn’t have more than one bite! Meals are very slow, even lunch. So don’t expect fast service or for your food to brought out quickly! Just relax and take your time! Service is already included in the price of the food, and you are not required to tip extra as we do in the United States. If you think the service is amazing you can give a Euro or two, but again, not required or expected. Coffee is a must. Try the espresso and mix in a little sugar. Don’t question it, just do it! Great Post Rachel, ah just what I was waiting for! The Jewish style artichoke looks amazing. Although all Italian food is supposed to be 'so' different from here, I noticed a lot of the more common style antipasti as we serve on trays before meals. 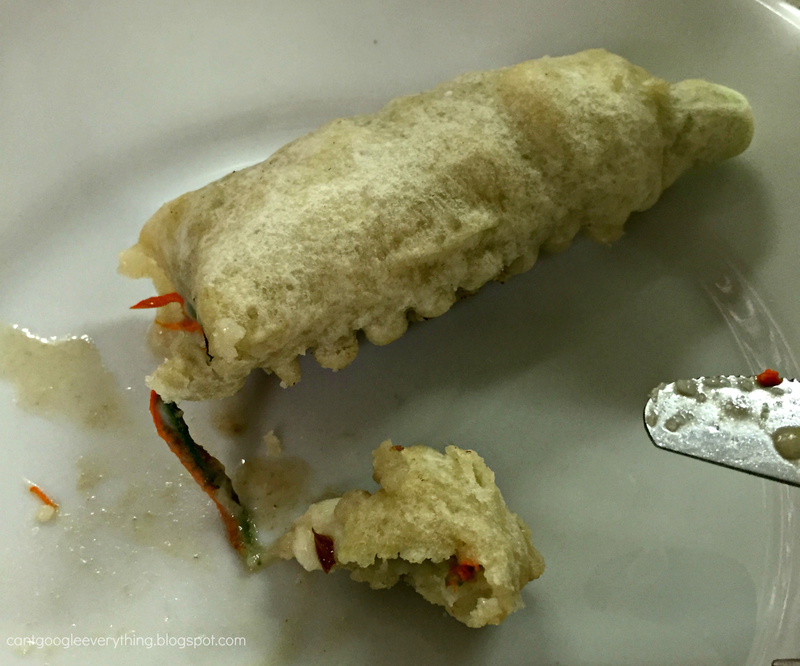 The stuffed zucchini flower looks lovely, I would be interested to know what was inside, some homemade ricotta, other cheeses, vegetables, seafood? I've got some blossoms in my garden and have been contemplating putting them to use. The lasagna looks good and I do love Osso Bucco. 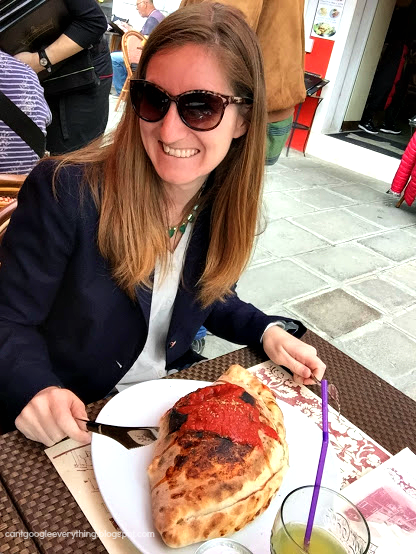 That calzone actually looks hilarious, so there goes the idea on the Americans eating over sized portions- that is, unless it catered to Americans who like over sized portions. The pasta looks amazing too! House wines are inexpensive and quite good all throughout Europe it seems. What an enjoyable trip to read about! Thanks for sharing. Peggy- the zucchini flower was amazing! It had some julienne veggies (carrots and zucchini I think), cheese and a hint of anchovies. Sorry I cannot remember the exact kind of cheese they used! The calzone was at a touristy spot, definitely for Americans. They also had a cheese pizza topped with fries called "American style" which we thought was hilarious since no one we know eats pizza with fries on it! Oh my gosh! I totally have to go to Italy. It's been a lifelong dream but all I see everywhere is "the food!!" lol, wonder how I'll manage it with gluten-intolerant kiddos? Ok, now I have to go eat lunch because that post made me really hungry! Oh Italy… how I wish I could go back there again sometime soon!! I agree, house wine there was AMAZING and there really was no need to spend money on the more expensive wines! Looks like you had a fabulous time!! Gelato in Italy was also pretty amazing… I was skeptical that it tasted that much better, but in all honestly I felt like it did! Ok, now I'm hungry. I love that in other countries the soda doesn't contain dyes or HFCS. I would do anything to eat ALL of that!! !